The deaths of five labourers at the construction site of the new airport terminal in Dubai will renew questions about conditions in which migrant workers toil in the United Arab Emirates. Those who died, and 12 more who were injured when a reinforcement cage supporting a wall collapsed, are understood to be from South Asia. Prestigious projects, like the $ 4.1bn airport expansion currently underway in Dubai rely mainly on workers from India, Pakistan, Sri Lanka and Bangladesh. These workers are cheap, usually earning fewer than $300 a month. They can be seen operating cranes at the huge Dubai International Financial Centre, digging the foundations of what is billed to become the world's tallest tower, Burj Dubai, and operating heavy machinery on the vast man-made Palm Island. Dubai is understandably proud of these projects and of the niche it has carved for itself in becoming a city with an impressively energetic and innovative reputation. However, it is worth remembering that without these guest workers such flagship projects would not be possible. The future prosperity of the city and its ability to create headline-catching superlatives for its ventures is dependent upon guest workers as well as on the flamboyant leadership which commissions the ideas. Yet the majority of these employees have no voice - not even when it comes to their own safety. Such workers are often the main breadwinners for their families back home. As such they are not in a position to lose their jobs through raising questions over on-site procedure. Dissent is not encouraged in the Gulf. Expatriate unions are not allowed. Safety on construction sites and more broadly within the workplace is currently a subject of debate in the UAE and one which is raised in the press from time to time. Similarly the local newspapers often carry stories of construction workers allegedly not being paid for months on end. They are not allowed to move jobs and if they leave the country to go home they will almost certainly lose the money they say they are owed. The names of the construction companies concerned are not published in the newspapers for fear of offending the often powerful individuals who own them. The ministry of labour says it takes workers' complaints seriously. It wants Dubai's reputation to remain intact. Nevertheless it is a bold expatriate labourer who starts the process which could ultimately lead to him being dismissed and deported for troublemaking. Some workers become so desperate that they decide to walk several kilometres from the camps where they live on the outskirts of the city to the ministry of labour. 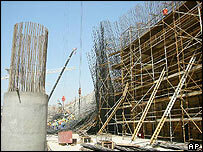 I have seen hundreds of migrant workers snaking alongside the busy, eight-lane Sheikh Zayed highway towards the city. I have also seen them stopped and surrounded by police in riot gear with only a few brave individuals able to proceed. Workers are aware that, if they are deported, there are thousands of other workers who will willingly take their place. With the economics so obviously unbalanced, it should be the role of the employers - government companies or privately run enterprises - to take responsibility and to ensure safety and fair play for their workers. In the case of the accident at Dubai International Airport, the President of the Department of Civil Aviation, Sheikh Ahmed bin Saeed Al Maktoum, has promised a full investigation. He has stressed that there are three independent safety bodies working on the site and that the safety of his employees is paramount. 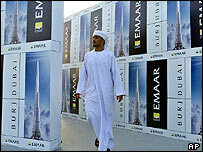 Sheikh Ahmed is the uncle of the de-facto leader of Dubai, Sheikh Mohammed bin Rashid Al Maktoum. As a member of the ruling family he has the ability to promise, and deliver. Construction workers around the city will be putting their trust in him to do just that.